I don’t know what it was about April, but I was seized with a need to MAKE STUFF WITH MY HANDS. Beautiful stuff. Practical stuff. Fun stuff. I just had to do it. Writing was not in the program. So in lieu of a proper blog post, here’s a gallery of the things I made, or had Ben make, during the month of April. I don’t even know how we did it, honestly, on so little sleep and with so little free time. Or why. Except to somehow hang to our humanity in the midst of continuous existential crises? Anyway, here’s what we’ve been up to. First, a painting that my mom commissioned for her living room wall. She paid me in free babysitting, the best currency. 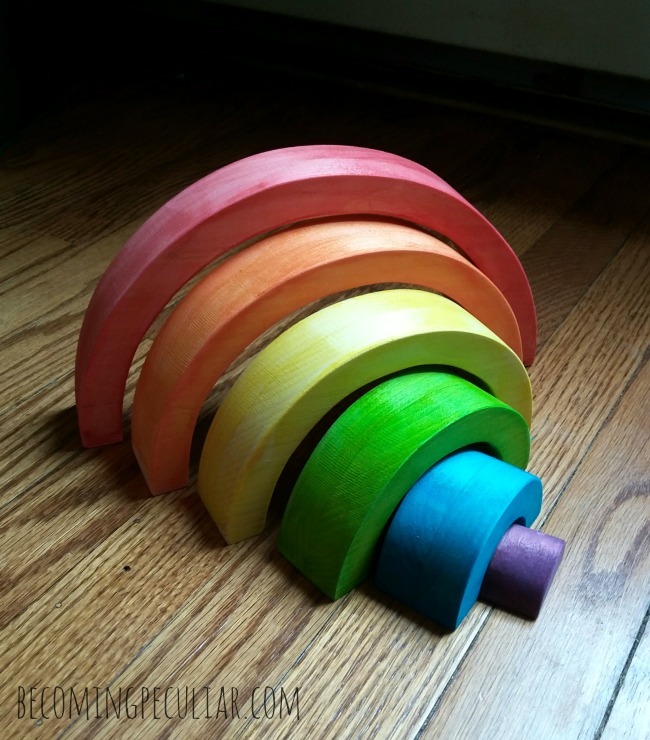 Then there was the wooden Waldorf rainbow stacker that I had Ben cut out in his shop. I helped sand it and then painted it with food colouring diluted with rubbing alcohol. As a late Easter present for Felix. 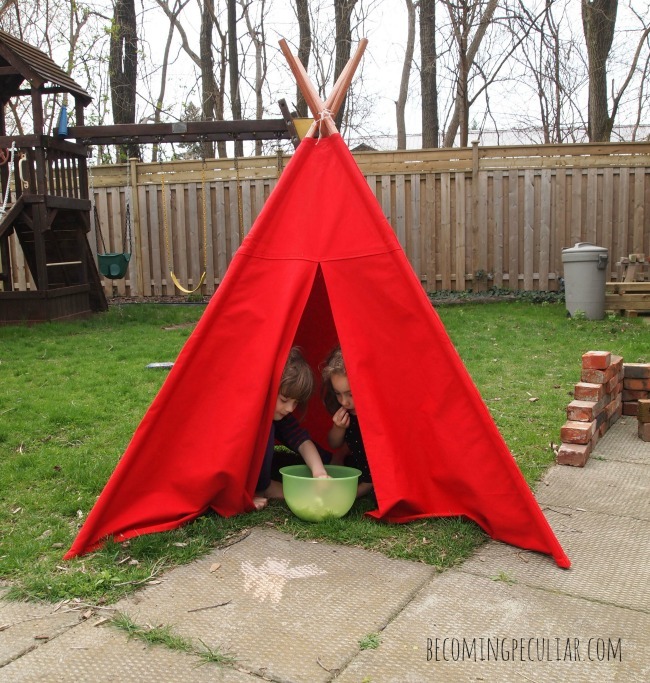 I then got the urge to break out my sewing machine and finally make that canvas teepee/tent I’ve been wanting to make for the kids. I followed a pattern I bought from Etsy. 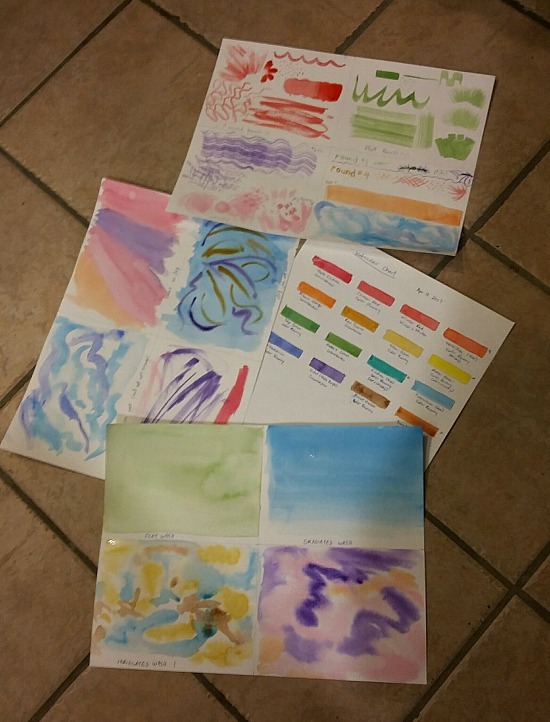 I was also recently overcome with a passionate desire to learn how to paint with watercolours. I’ve been obsessively watching tutorials on Youtube whenever I feed Felix. I dream about it at night and take out stacks of books from the library for inspiration. I think I’ve already spent $200 in materials. 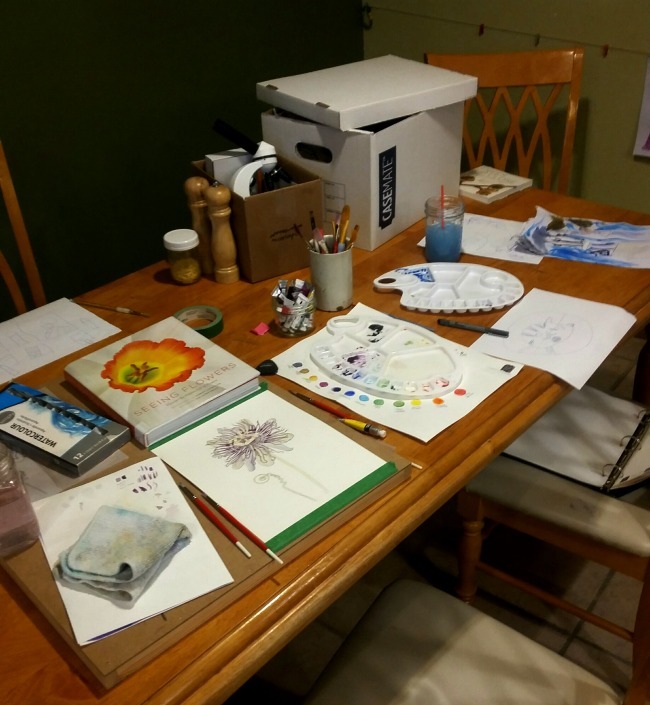 Me and Lydia taking over the kitchen table with our artwork. And lastly: I asked Ben to make Felix a Pikler triangle to practice his climbing. Felix’s gross motor development kind of plateaued last year despite continued physiotherapy and the use of orthotics, and I’ve been trying to think of ways we can add to his environment to encourage his development. I came across the idea of the Pikler triangle from someone on Instagram — it’s fairly common (or at least recognized) in Montessori and RIE circles. Anyway, my amazing husband whipped one up in an afternoon, just by looking at a few pictures online. (He’s a carpenter by profession, if you didn’t know.) Felix immediately took to it and has been getting some awesome practice in. Anyway, if you wonder where I’ve been or why I haven’t been blogging, this is part of the reason. I’ve been busy making stuff. That, and I’m struggling to understand who I am in the world and the purpose of my existence. My life feels like a mess and I’m stumbling through it aimlessly, wondering what it’s all for and how we can find meaning and happiness. You know, that kind of stuff. 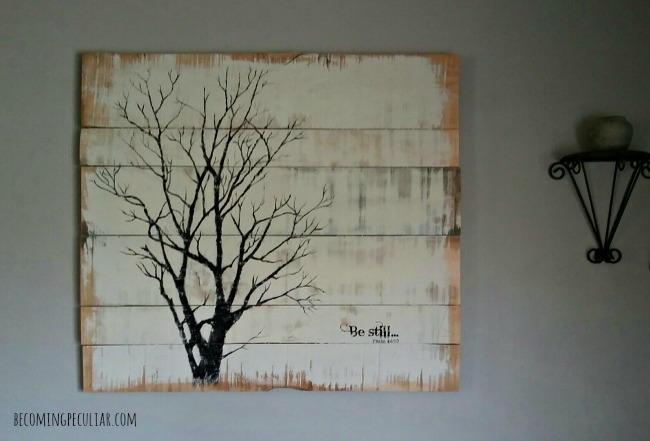 Your paintings are so inspiring and beautiful! I love the flower. 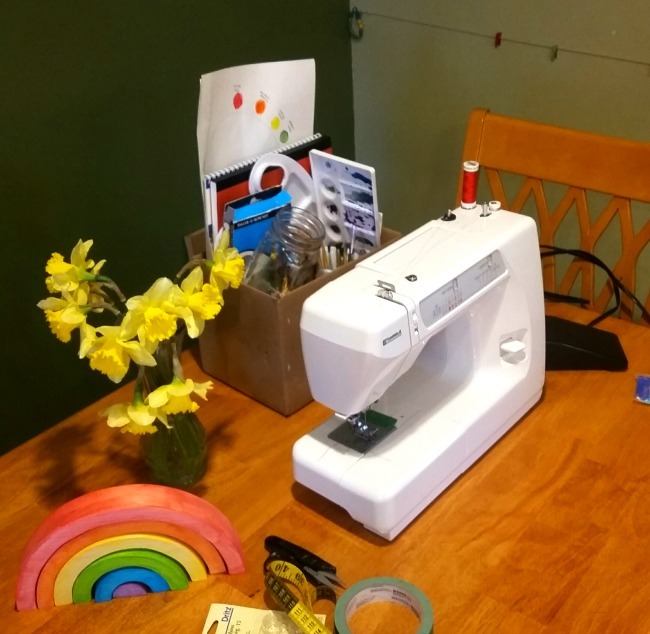 Also, I have the exact same sewing machine! I wonder—can you tell me what the name/number/type of bobbins it uses? I have exactly ONE bobbin I’ve been using the last 10 years, and the couple attempts at eyeballing a replacement have been wrong. The manual doesn’t eve say! Creativity is truly so healing. Thank you, Hope! It’s a good sewing machine, isn’t it? My mom got it for me when I was a teenager and it’s gotten lots of use. Ack, only one bobbin?! I probably have a dozen and I don’t even sew that much. I must have gotten lucky — I just grabbed whatever bobbins were at our local fabric shop. I have Dritz Class 15 bobbins, both in plastic and metal, and both work fine. Good luck! That is good to know. I will get some Dritz Class 15. Yes, it is a good machine. I got it for Christmas when I was 14, and it has served me very well. Beautiful things you’ve both made. Beauty brings a richness into our days. Life is a mess sometimes, asking questions is one of the best ways to respond. But in the meantime, you’re doing an amazing job of of living a rich, full life; creating beauty and caring for your family. You are a strong, resilient, beautiful person. Hang on in there. And keep on going with your instincts…they’re usually right. :) Blessings! Thank you so much for your kind words, Angela! Beautiful! I love that painting you did for your mom. And what a blessing to have a husband who is so skilled in carpentry. My husband dreams big, but our skills do not match his ambitions, ha. A Pixler triangle is a great idea–the special needs preschool where I used to volunteer had several variations of those in different materials and sizes in the gym space and some of the classrooms, and the kids loved them. Botanical drawings are Amazing! 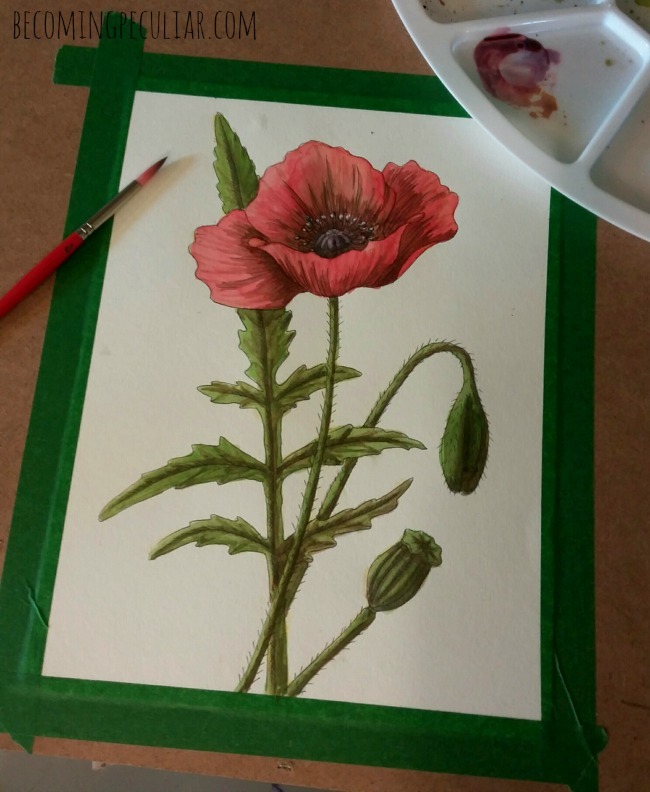 Your poppy is really Lovely and well done! I like how you show your ‘progress’ shots with your color blocks and blending techniques, too. I’m glad you are finding a way to stoke your creativity, make beautiful and useful items and find PEACE from the past few years; some change may be good, but it’s amazingly stressful, nonetheless. I’m glad you’re finding your pace; the road is long, but the view is beautiful along the way. These are all so great. I love your painting so much!!! You should be creating, you are so great at it! And yes to the processing, I don’t know how some people seem to get over stuff so quickly and I’m like nope..still going over that. Your work is beautiful, and I think you are doing a beautiful job too. I’ve been thinking of you all week actually, and the processing and healing you are going through. I keep thinking about how when life spins out of control, and we feel we can’t get a handle on anything, that it is wonderful that you are giving yourself space to create, and especially with things that are tangible for you right now (that you can get a handle on) as your spirit and mind work on the spiritual creation of what your life will be with these unexpected circumstances. I send my wishes of peace, love, fullfillment, and hope for joy that will come. I’ve also been listening to a series called Everything Creative (as I try to figure my life out! ), actually on the Mormon Channel, about the different ways people use their creativity to find fulfillment. I was touched by many, but I thought of this episode specifically as it relates to your circumstances. May God bless you. Thank you so much for your positive words and thoughts. They mean so much to me. That episode sounds RIGHT up my alley, thanks for the recommendation! 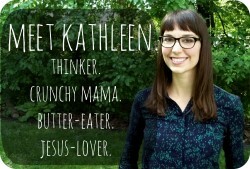 Kathleen! Your art is AMAZING!!!! Can you open an Etsy store, please please please? I hope these things continue to be a sustaining source of hope and peace for you. 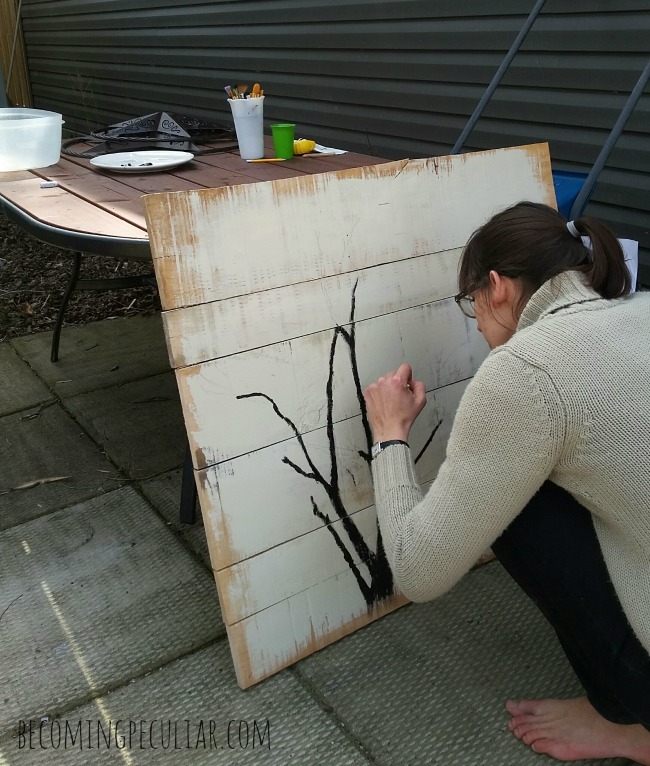 In my own darkest days, creating something – whether it was a story or painting or song – was often the only thing that kept me going. It gives you hope that there’s meaning and possibility underneath all the darkness. The pikler triangle looks fab, so does the rainbow! I’d love a Grimms rainbow but they are very expensive and don’t have the woodworking skills to make one! 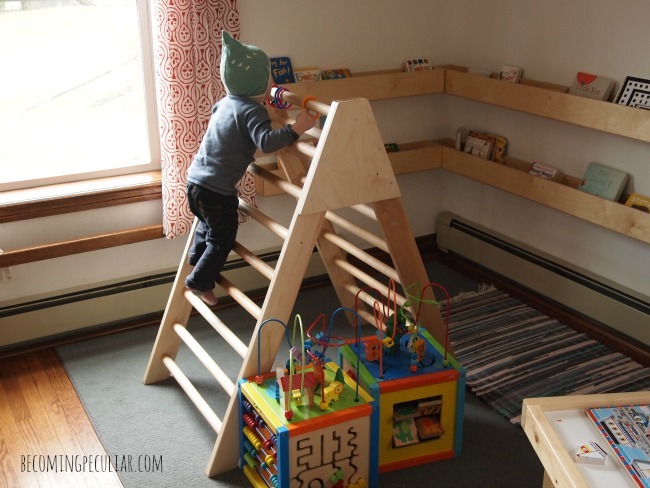 In terms of gross motor skills have you seen Wobbel boards? We have one for our 18 month old, and she loves it. Definitely good for motor skills and balance, and just a fab open ended toy.